What do you get when you cross a Middle Eastern dip with a Southern staple? 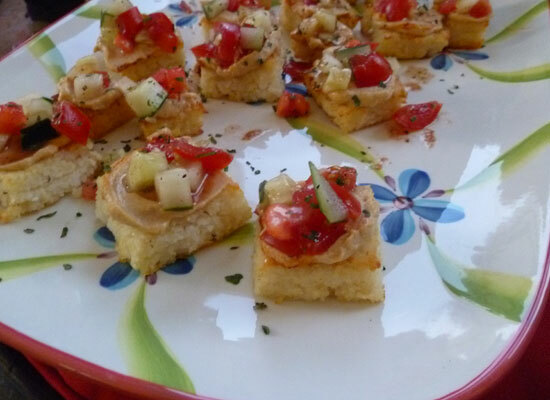 This is what the Barbecue Tricks kitchen came up with… a Hummus and Grits Bruschetta. Recently, we were selected to participate in a Foodbuzz Tastemaker program with Sabra. Having only recently discovered that I LOVE hummus, and needing a new appetizer for cookouts, this was a challenge I sank my teeth into. The following is a delicious way to serve Sabra Hummus at a cocktail party. I make the grits squares in advance and pull out and top with the hummus and veggies to serve. EASY and delicious! 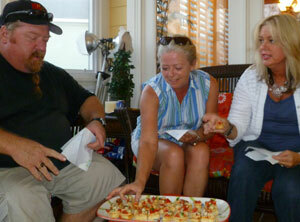 The little squares were a hit after a recent GrateTV taping with Jack and Mary Waiboer. To prepare grits, bring broth and water to a boil in a large saucepan. Stir in grits and return to a boil. Cover, reduce heat and simmer 5-7 minutes or until thickened – stirring occasionally. Stir in Parmesan cheese, garlic powder and salt, and remove from heat. Spray a 13x9x2 dish and a 9×9 dish with non-stick cooking spray. Pour grits into prepared pans. Spread evenly and shake to level out. Cover and chill for at least 2 hours. 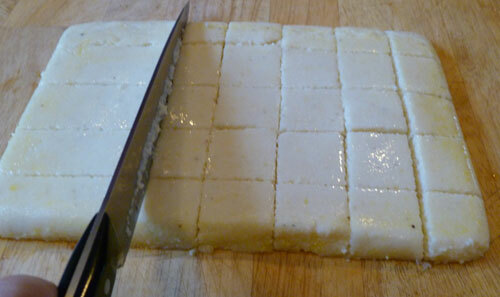 Invert grits onto a cutting surface and cut into 1-inch squares. Place squares onto a greased cookie sheet. Bake 15 minutes on 400°. Turn grits squares over and bake another 45 minutes. Squares will be crispy and brown. After they cool, place in an airtight container to store in fridge or freezer until ready to serve. pepper, and set aside. 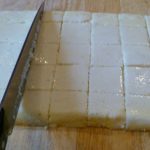 Allow grits squares to achieve room temperature. Spread each square with Sabra Supremely Spicy Hummus. Top with chopped mixture, sprinkle with cilantro and serve. Great party food – yum! Try it and let me know what you think in the comments below. On this weeks episode, Jack takes a question concerning a thin skinned cooker and how to keep it warm, West brings out a gadget for the dog days of summer plus a little nectar of the Gods on this weeks GrateTV. So hug your momma and get ready to FIRE IT UP!